The EUP3270 is a synchronous step-down converter capable of driving 4A continuous load with excellent line and load regulation. The EUP3270 operates in either CC (Constant Current) mode or CV (Constant Voltage) mode with an input voltage range from 4.5V to 30V. The EUP3270 provides programmable cable compensation by adjusting external resistor divider. 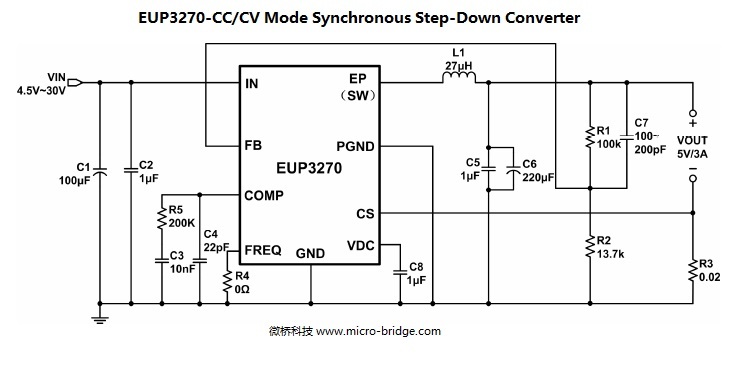 External shutdown function can be controlled by pulling COMP pin to a level below 0.14V. The EUP3270 is available in SOP-8 (EP) package.